We recently welcomed one of our newest partners to The Clubhouse Network. 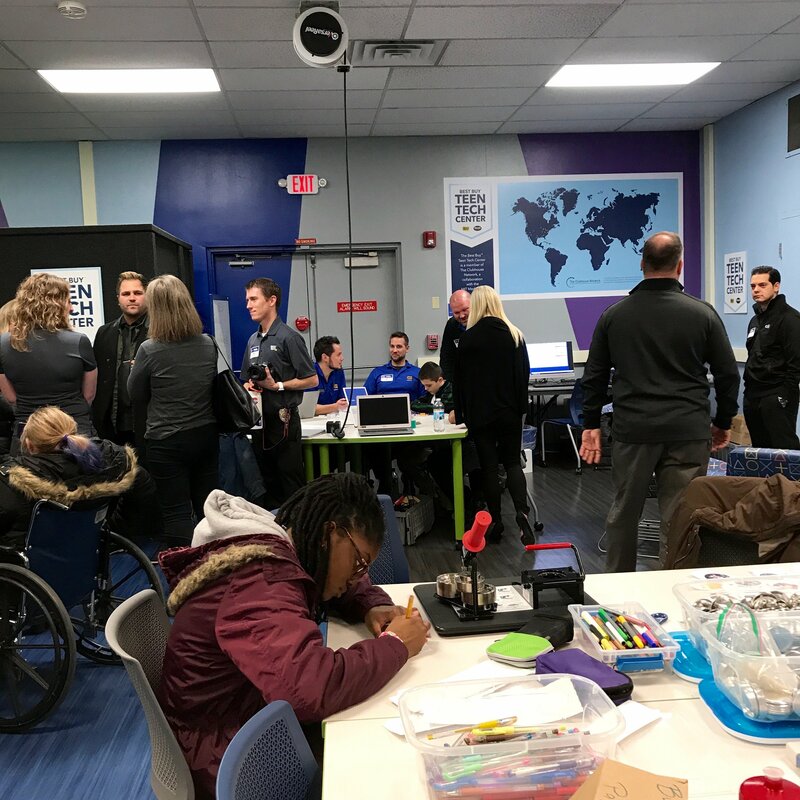 The Best Buy Teen Tech Center at Cleveland Public Library’s Rockport Branch held their grand opening on November 14, 2018. The new center features a professional recording studio, a 3D printer, a laser engraver, digital SLR cameras, GoPro cameras, Oculus Rift virtual reality system, and Adobe applications including Illustrator, InDesign, Photoshop, CorelDRAW, and more. This new center joins a global community comprised of 100 Clubhouses in 18 countries which provide 25,000 youth per year with access to resources, skills, and experiences to help them succeed in their careers, contribute to their communities, and lead outstanding lives. The mission of The Clubhouse Network is to provide a creative and safe out-of-school learning environment where young people from underserved communities work with adult mentors to explore their own ideas, develop new skills, and build confidence in themselves through the use of technology. The Best Buy Teen Tech Center at Cleveland Public Library’s Rockport Branch is open five days a week and will serve youth ages 10-17. There are no fees to participate and membership is free across all Clubhouses in our network. Learn more about The Clubhouse Network and our learning model. Get involved by becoming a mentor, a sponsor, or by supporting the Network. America's second-largest newspaper has featured The Clubhouse twice. "Not Just Closing a Divide, but Leaping It"
The oldest and largest daily newspaper in Boston covers the Grand Re-Opening of The Flagship Clubhouse. "A new Clubhouse for nonprofit that helps kids build confidence"
Atlanta area Clubhouse members speak about their Clubhouse experiences. "Kids Eager Learners at Clubhouse"
The film-industry giant interviews a member about one of his projects. A moving preview of the documentary film Chicago teens created to tell their personal stories. Major League Baseball star Mariano Rivera opens two Clubhouses in Panama. "At Home, Mo Pitches In"